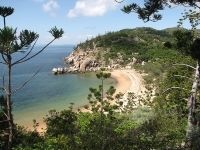 Magnetic Island was named by Captain James Cook in 1770, when he believed that the landmass of the island affected the magnetic compass on his ship, 'Endeavour'. More than half of the island, which is about five miles (8km) from Townsville, is a National Park known for its rugged landscape of granite boulders, hoop pines and eucalyptus trees. The island has 23 beaches and bays, some of which can only be reached on foot. There are more than 12 miles (20km) of walking trails marked out on the island. Part of the Great Barrier Reef Marine Park fringes the island, which is also home to the most northerly colony of free-ranging koala bears in Australia. The island offers a wide range of accommodation and transport is available on the island.